Last night, the three of us strolled over to the Storefront for Art and Architecture here on Kenmare Street in NYC, to catch the last 20 minutes of the sold-out dance performance Pharmacophore: Architectural Placebo from the street. Storefront’s fun cut-out façade, which opens the small sliver of a space to the sidewalk, allowed us to enjoy the rather unique dance performance. A collaboration between designers Seth Harrison and Ariane Lourie Harrison of Harrison Atelier (HAt) and choreographer Silas Riener. The third installment in HAt’s Pharmacophore series, the performance, along with the installation, explore the cultural and philosophical economy that surrounds medicine technology and the human prospect in the 21st century. The installation at Storefront, incorporating set and costumes, evokes a hybrid pharmaceutical-cultural landscape: both a medical waiting room with inflatable “plants” and a radiological suite in which the audience sits apposed to translucent glass. The installation consists of 24 eight-foot, laminated glass and stainless steel structures, arrayed along the back wall of the gallery. Contoured seats are dotted with inflatable forms that, when unfurled, become spatializations of pharmacophores. The inflatable set pieces are used as costumes and props, and audience members use them as cushions. Truthfully, we did not see enough of the dance performance to justify an opinion, but what we did see, we liked. The Merce Cunningham dancers pranced, tumbled and gracefully walked with their fun inflatable tubular costumes that match the props and seat cushions in the beautifully glowing blue setting. We loved everything about the installation: the appropriately sterile pharmaceutical feeling evoked by the lighting and plastic inflatables; the clear Muji raincoats that acted as lab coats and were worn by staff; the seats with their mod-waiting-room feel; but most of all, the way it all worked so well together and successfully integrated with the space. And if that wasn’t enough, Baryshnikov was in the small audience! 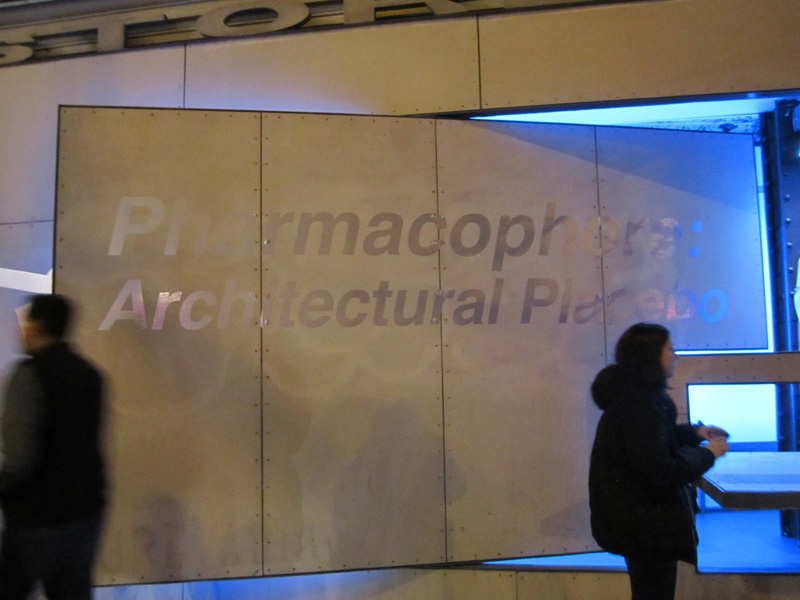 Pharmacophore: Architectural Placebo will be performed twice a night through this Wednesday, November 30th. Tickets are free, but reservations necessary. And then there’s always the street view, too, if you want to use the stroll-by approach. The installation, sans performance, will continue on view through December 3rd. This entry was posted in Architecture, Art, Event, Fun, Just Plain Cool, Music, NYC. Bookmark the permalink. Free Domestic Shipping on EARonics!